Photo provided by Jiří Horák. The Naumburg Cathedral contains artistic masterpieces of the workshop named ‘the Naumburg Master’. The 13th century romanesque former Cathedral (now a Protestant church) distinguishes itself with its gothic west choir with the famous donor portrait statues of the twelve cathedral founders (Stifterfiguren) and the Lettner. I take Naumburg cathedral as the epitome of central-european church from mid-13th century. The monumental building has two choirs, four towers, adjacent cloister. The highlight is obviously the decoration of the interior. 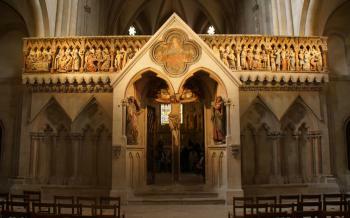 I loved not only Ekkehard and Uta, but all the sculptures and stone carvings of the western choir from ca. 1250. 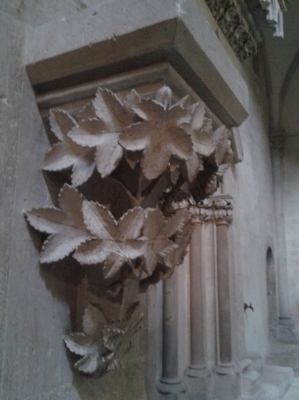 The floral decoration is simply beautiful and naturalistic (see photo, sorry for low quality...) - the leaves seem to be in the wind - that is quite typical for this period of early gothic in central/eastern Europe and can be seen also in several churches in Czechia. 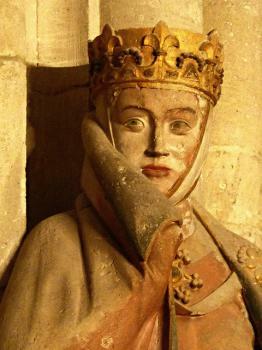 I could see other works of Naumburg`s master in Meissen cathedral. The Naumburg work is however the best one. I visited Naumburg and several places around ca. 15 years ago, I could see also sites that were included in one of the trials to enter the list. Well, all the process was a little bit odd, but the result that only cathedral became WHS is positive. I visited this tentative WHS in November 2014. It's a fine cathedral like many others on the list already and this might make it to the list in 2015. We'll wait and see. The highlight of my trip were the works of the Naumburg master. The film displayed on the upper floor above the ticket booth is really worthwhile viewing to get a detailed overview of the Naumburg master's works and a comparison with other cathedrals and churches in Europe. The combined ticket costs 6 to 8.50 euros + 2 euros for photography which is quite expensive especially by German WHS standards. Naumburg has been nominated for inclusion in the World Heritage List in 2015. Initially, only the Naumburg Cathedral was registered in the tentative list, but a few years ago the site was extended to a cultural landscape and renamed as: "The Naumburg Cathedral and the landscape of the rivers Saale and Unstrut an important dominion in the High Middle Ages". The high density of preserved monuments from the 10th to 13th century is considered to be the unique feature: a kind of model landscape of the Middle Ages with testimonies of religious and secular power. In a radius of 10 kilometres around the confluence of the Saale and Unstrut are castles and monasteries, remains of city fortifications, small parish churches, and a pleasant landscape with orchards, river meadows, and of course also vineyards. I have visited the Naumburg Cathedral sometime in the 1990s and again in April 2014. The cathedral is a mixture of late Romanesque and early Gothic elements, the change of styles can be seen in the two rood screen, which divide the interior into a central nave and two choirs. 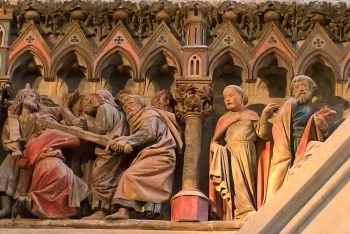 Most impressive are the marvellous works by an unknown artist, called the Naumburg Master: the reliefs depicting the Passion of Christ and the Crucifixion sculpture on the rood screen of the western choir (photo), and especially the statues of the twelve founders in the west choir. The very individual drawing of the faces and gestures is amazing, each sculpture is characteristic and distinctive. Quite unusual for a cathedral in Germany that you have to pay an entrance fee (6.50 Euro plus 2 Euro for photo permission). On my second visit I paid more attention to the surrounding landscape and visited several of the locations listed on the nomination webpage. But these are rather mediocre sites, enjoyable to visit but not very exciting. After visiting the cathedral, I first took a walk through the old town of Naumburg: pretty town houses around the market square and a massive medieval city gate (Marientor). The most interesting site in the proposed area was the former Cistercian monastery Pforta with a nice old cloister and an imposing gatehouse. Also noteworthy: the double chapel in Neuenburg Castle high above the town of Freyburg and the parish church in Flemingen with nice frescoes in the apse. From the small Romanesque church in Zscheiplitz you have a nice view of Freyburg, Neuenburg Castle and the Unstrut valley with steep vineyards, it is the most scenic part of the nominated area. Other main objects are: the castles of Schönburg, Rudelsburg and Saaleck, Goseck church and castle and the Romanesque House in Bad Kösen (formerly a grange of the Pforta monastery). Two places not connected with the Middle Ages might be of interest: the large graduation tower in Bad Kösen and the reconstruction of the Neolithic Goseck circle. So to sum up: the Naumburg Cathedral is the landmark of the nominated area and well worth a visit, twenty years ago it would have been inscribed without any problems as a single monument. However, none of the other buildings and sites are of outstanding value. But who knows? The high number of monuments in a relatively small area is certainly a plus, and also that the landscape has not changed substantially over the centuries. So this could be a nomination, where a good story and a comprehensive dossier finally leads to an inscription. Controversial at inscription: After 2x negative advice being overturned by the WHC, ICOMOS could not do a full evaluation anymore and was unable to provide a formal recommendation. In the end it stuck with its Not inscribe because no OUV, which was turned around by 2/3 majority in the WHC to full Inscription.